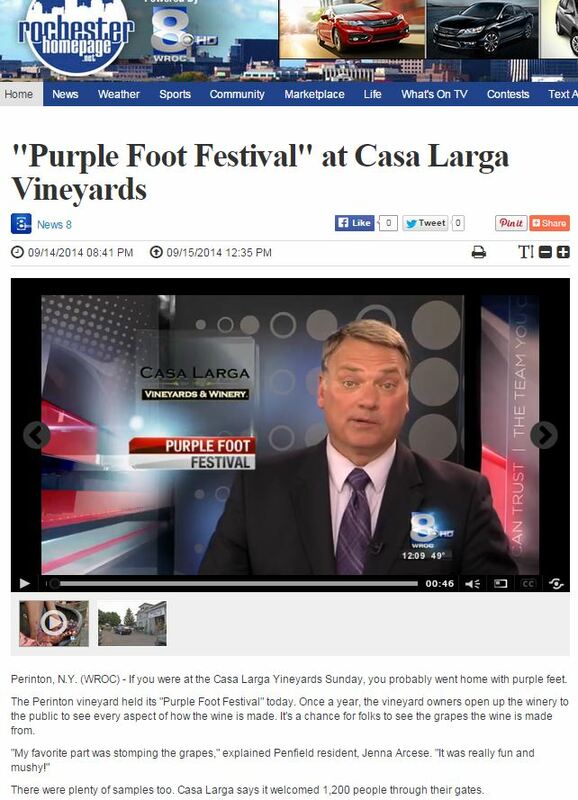 Casa Larga’s annual Purple Foot Festival is a celebration for the start of harvest season. It is one of the winery’s family-friendly events and is a day full of activities, wine seminars, tastings, food, shopping and the big draw: grape stomping. Like any large event, Casa Larga begins planning for the festival months in advance. Each year, the winery prepares for close to 1,500 visitors who hear about the festival through a mix of channels: email marketing, Facebook and Twitter posts, television and radio appearances. In the two weeks leading up to the 2014 event, two tragedies deeply affected the Rochester community. News reports were heavy and focused on a fallen officer and the deaths of two local philanthropists. For an event that never struggled for media attention, we were facing a week of serious news and the challenge of bringing attention to this lighthearted event. The brightest part of the daily news, we realized, was going to be the weather reports. There was no way we could bring media out to the winery for promotional grape stomping and purple feet before the festival as we had in past years. Instead, we brought the purple feet to them. We delivered purple gift bags tied with purple ribbon to the weather teams at the local news stations. The bags held purple toe socks – a pair for each meteorologist – and we delivered them with a grape pie. On the outside of the bag, a purple footprint outlined why they were receiving the bag and what they should do with the contents, and a little about the (well-known) festival. Our work resulted in several extra mentions on local news stations and social media buzz from local news personalities. 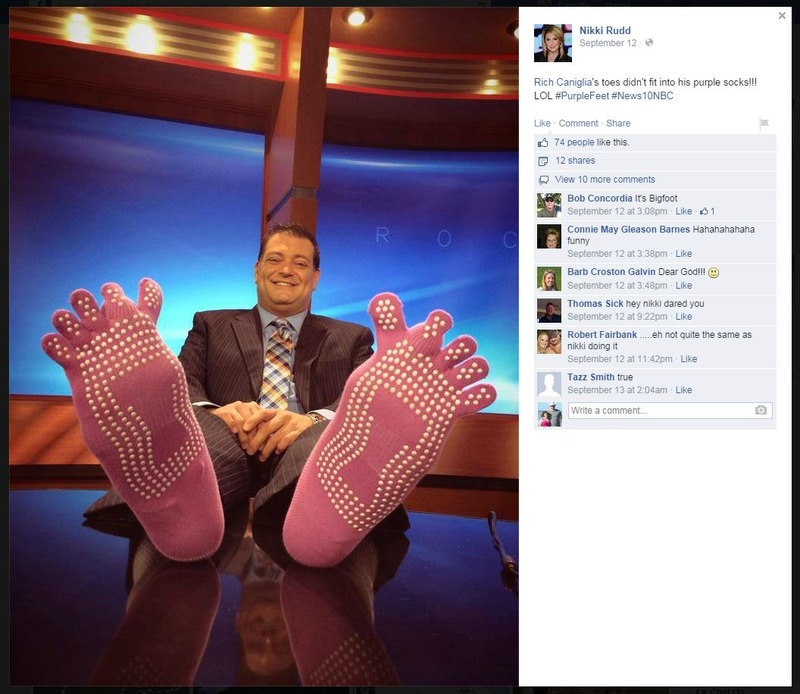 Three of the four local channels talked about the socks or pies and mentioned the festival on air. 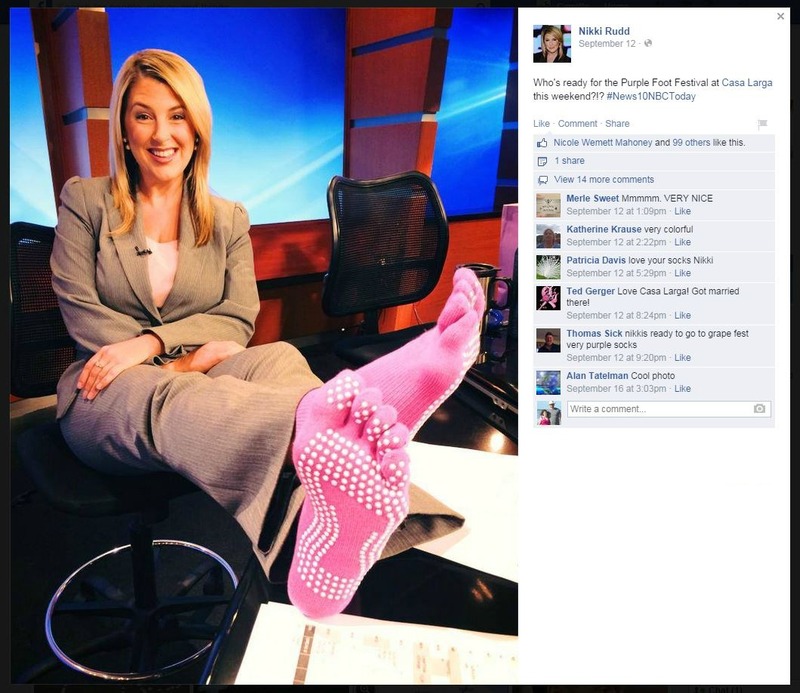 A reporter even wore her socks on air and posted a picture wearing the socks at the news desk! She also posted a photo of a meteorologist whose toes didn’t quite fit. It was funny and lighthearted, and the posts combined received 173 likes, 36 comments and 13 shares. The festival in 2014 was a success, with no negative effects on attendance from recent events or cold morning weather. Approximately 1,200 people attended.